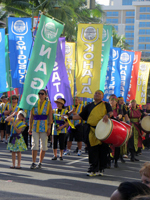 The Honolulu Festival: Unique Cultural Experiences and Free Hawaii Vacation Fun. and Free Hawaii Vacation Fun in Waikiki! 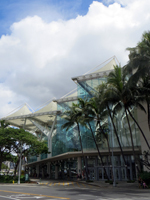 I like the location in the Hawaii Convention Center because parking is convenient, and it’s air conditioned/climate-controlled inside, so you don’t have to deal with sunburns, strong winds, or rain. I also prefer the afternoon/evening parade because it’s cooler and more comfortable than during the heat of the day, and the lighted floats are a nice change from the norm. 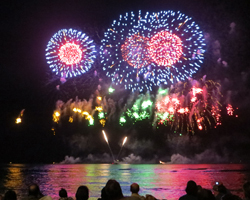 Finally, the Honolulu Festival ends with fireworks; and it’s hard to beat watching fireworks from Waikiki Beach while all your buddies are back home freezing. So what exactly is the Honolulu Festival? 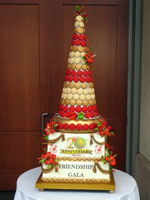 First of all, and more specifically, it’s primarily located in the Waikiki area of Honolulu – though there are a couple of event activities around the downtown Honolulu area. It used to always be held on the second weekend of March; but for the last few years, it has fallen on the First weekend of the month. 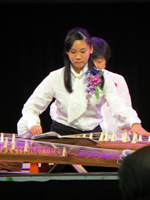 Participating groups come from Hawaii, Japan, Korea, Australia, Tahiti, Taiwan, the Philippines, and even Alaska. They probably originate elsewhere also, but those are the places I remember to be represented. 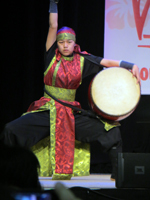 All the groups showcase their various cultures through music, dance, and/or cultural demonstrations. 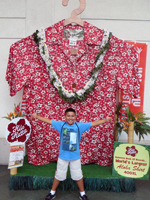 They display their arts and crafts, such as Hawaiian quilting (see photo at bottom), origami, or woodworking; and they encourage visitors to get hands-on and give these crafts a try. 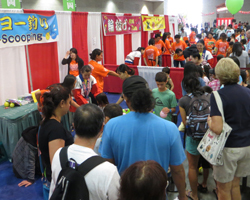 There are numerous vendor booths, game and activity booths, and cultural display booths. 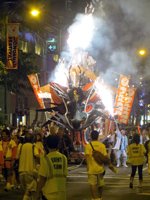 Plus, the Honolulu Festival has the first Bon Dance of the year. If you get tired, have a seat and watch some of the free performances – on stage throughout the day. Yes, the Honolulu Festival is a three-day event, but the first day isn’t really for the general public. Much of the day is spent hosting various school field trips, presenting awards to the participants, attending an invitation-only luncheon, and/or at a banquet that definitely isn’t free. On Friday, if I were you, I’d go to the beach or do one of the many other Hawaii vacation activities discussed on this site. 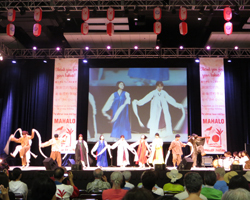 All day long, the stages at the Hawaii Convention Center, Ala Moana Center, and the Waikiki Beach Walk will feature a constantly rotating variety of performances by all the various music, dance, and cultural demonstration participants. Because the majority of the Honolulu Festival activity is centralized at the convention center, that’s the only place that I’ve watched these acts. As a result, I can’t actually give you much specific information about the performances at the other two locations. It has always been my understanding that the acts rotate from one stage to the next throughout the day… but don’t hold me to that. 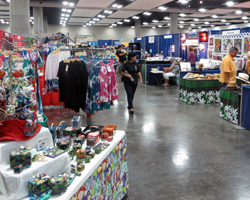 Also throughout the day, the convention center features carnival-style games for anyone who wants to participate, a craft fair, food, and a free film festival. 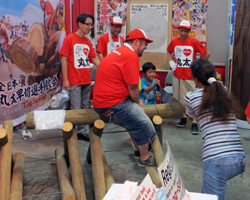 At scheduled times during the day, event activities include a hula workshop, mikoshi (portable Shinto shrine) unveiling ceremony, Bon Dance, and more. 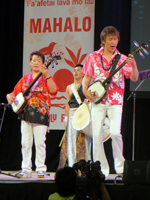 For a complete schedule of activities, please see the Honolulu Festival official site (link opens a new window/tab). 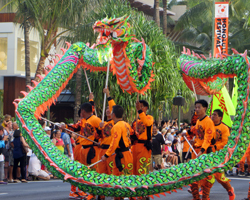 From approximately 4pm to 8pm, most of the various acts that have been performing on the stages throughout the festival take to the streets for a parade along Kalakaua Avenue from the convention center to Kapiolani Park. This is your chance to see them all. 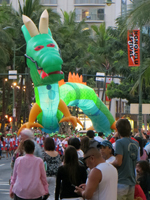 And because the parade continues past dark, the highlights often include lighted floats, a glowing green dragon balloon, and a fire-breathing dragon. 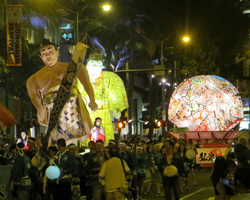 Once the parade is over, make your way out to Waikiki Beach near the Moana Surfrider hotel and watch the fireworks show, which starts at approximately 8:30pm. It’s not necessarily the greatest variety of fireworks I’ve ever seen, but the sheer size and quantity of these pyrotechnics make for an impressive show. 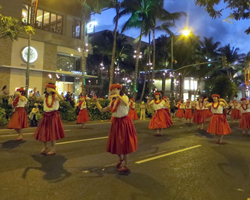 Although I wouldn’t plan my entire Hawaii vacation around this event (unless I was one of the participants), it’s hard to beat having a whole weekend of fun and free things to do in Waikiki with tons of free Waikiki entertainment. If I was already planning a March family vacation in Hawaii, I would definitely add this to my Hawaii activities itinerary! Unless you really feel compelled to catch every single performance, I’d probably just plan to visit the convention center for a couple hours on Saturday or Sunday. That should be sufficient time to see all the booths, participate in a couple different activities, and watch one or two acts. Then get out and enjoy the rest of your day. If you can catch the parade, that will show you almost every other act that you didn’t watch on stage. Then go enjoy the fireworks. Although the best views can be had from a spot in the sand, several of the Waikiki Beach hotels have beachfront bars and restaurants that would also give you a great view of the fireworks; but make sure you pick your place early and make reservations in advance. It’s going to be very crowded with other people who have the same idea.